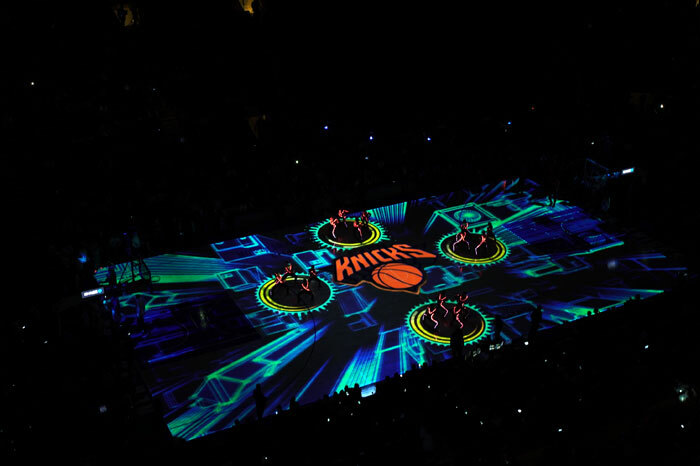 When it came time to consider creating a floor-based video projection system for their facility, the management team responsible for entertaining Knicks and Rangers fans knew the system would have to live up to the legacy of New York’s Madison Square Garden (MSG), aka The World’s Most Famous Arena. It would have to be better than anything else currently being used, so they called in WorldStage amongst other expert consultants and fabricators. Video projection on NBA courts and NHL rinks have become a staple of arenas in North America where they are primarily used for pre-game and half-time presentations. The systems typically used in arenas rely on older HD-resolution projection and, while fans have appreciated the effect, the MSG team felt that improvements could be made using the latest lighting and video technologies. 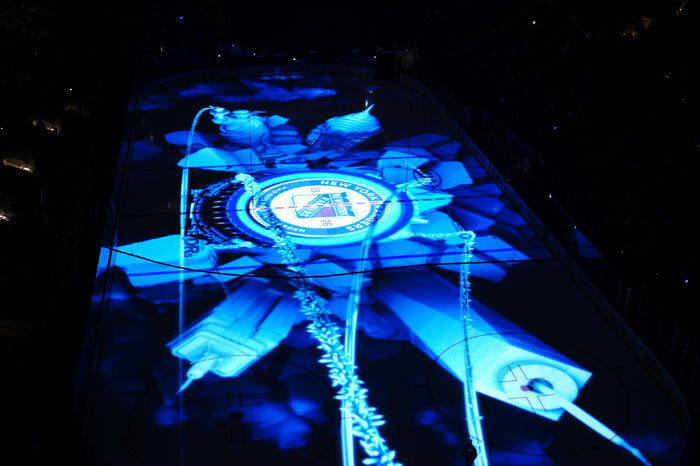 Months of planning culminated in the recent debut at a NY Rangers game of a projection system from WorldStage, which provides visibly sharper images. Additionally, a new large-scale lighting system installed by MSG features more than 100 Vari*Lite and Clay Paky moving head luminaires. The new system syncs projection video, scoreboard video, lighting and sound, transforming MSG into a dynamic immersive environment that delights fans. For added effect, even the leotards of the Knick City Dancers troupe have synchronized LED lighting features. To pull off this feat, MSG brought in a team of experienced engineers and designers to specify the system, create content and support its implementation. Work commenced immediately after the end of the 2014-2015 NBA season, and by early September 2015 everything was in place and ready for programming. One of the iconic elements of MSG is its suspended ceiling that covers the entire arena. Management wanted the visual impact of any new equipment to be minimal and not clutter the ceiling area or impact sight lines to the center-hung scoreboard. Therefore, the projection system design team, led by WorldStage, based their location plan on existing ceiling lighting bays and placed the projectors above the ceiling – invisible to the audience and a rarity for systems of this type. This requirement necessitated very careful modeling of the arena in 3D to make sure that existing holes in the ceiling would allow the projectors to cover the entire 200 x 85-foot hockey rink. It also required some extremely flexible custom projector mounts designed and installed by Hudson Scenic Studios to provide a precise degree of rake and tilt. WorldStage used 14 Christie Boxer 4Ks with each portion of the ice surface receiving 60,000 lumens across an enormous 21 million pixel total image area measuring 7,020 by 3,060 – many times the resolution of an equivalent High Definition projection system. “The advantage of 4K projection is evident in the resulting image, which is much crisper and has greater color depth than other HD-based systems,” Weisberg adds. Content playback and image warping is handled by an extensive networked graphics system based on d3 Technologies 4x4pro. These media servers are configured as full UHD (2,160 x 3,840) outputs and feed a Harris Imagine router before hitting the projectors. WorldStage also provided 56-input multi-view capability for monitoring as well as a custom programmed touchscreen console for the system show operator. In one of the most effective couplings of video and lighting, MSG and the lighting design specialists from Arc3 Design, created lighting programming that complements the video content, expanding video effects across the entire arena. This element is supported by the new moving light system installed over the summer and consisting of 150 Vari*Lite and Clay Paky fixtures mounted across the ceiling. Their lighting effects include a remarkable “pulse wave” effect as well as a “laser bolt” cue that fires vivid blue and red beams up through the audience. Since no presentation can be effective without great content, no matter how advanced the technology, MSG turned to the team at Batwin + Robin Productions to create signature openers for the Rangers and Knicks teams. Both pieces feature original sound tracks and a mix of dynamic 3D animation as well as still and moving images. Providing more of a narrative than most of the pieces playing in other arenas, the Rangers’ opener draws on the team’s New York ethos as well as its long and successful legacy in the NHL. As iconic New York buildings break through the video ice in 3D, the fans are reminded of how gratifying living in Rangerstown can be. For the Knicks, the tone is a little more cutting-edge and razzle-dazzle. When the Knicks’ dance troupe enters, the video syncs with the scoreboard, the court floor and the dancers’ costumes, and lighting pulsates to the music. It’s as rousing a start as you’ll find at any NBA game. At WorldStage, Joshua Weisberg was system architect, Lars Pedersen was account executive, TJ Donoghue project manager, Barry Grossman system designer, Julian Chaves assistant system designer, Paul Clements lead installer, Hector Vega wiring lead, Gabriel Weisberg assistant installer, Michael Kohler lead d3 programmer, Raul Herrera Widget designer programmer, Alex Bright d3 programmer, Dennis Alfonso lead projection technician and David Valle 2nd projection technician. At Arc3 Design Zakaria Al-Alami and Michael Appel were the lighting designers. At Batwin + Robin Productions Linda Batwin and Robin Silvestri were executive producers and Meghan Gargagliano associate producer. Marc Bauman is the Senior Vice President, Executive Producer at the MSG Creative and Technical Production Services Group.